The all-new Jeep Wrangler JL is an excellent machine, offering improvements in pretty much every area compared to the out-going Wrangler JK. I have taken a few different models through serious off-roading conditions and they were as great as you would expect, but the new Wrangler lineup just got a little more capable in the worst situations thanks to the arrival of the Moab Edition – spreading Rubicon features to other models. The Jeep Wrangler Moab Edition is based on the Sahara package, but it is clad with an array of parts from the top-of-the-line Rubicon package. This includes the Rubicon hood, steel bumpers with removable end caps, rock rails and 17-inch wheels painted Low-Gloss Black. The headlight surrounds, grille throats and tow hooks are also painted Low-Gloss Black, while the Moab decals on the hood are black as well. The body-colored hard top is standard, but buyers can opt up to the Dual Top Group or the Sky One Touch power top. The Jeep Wrangler Moab Edition is available in Granite Crystal, Billet Silver, Punk’n Metallic, Mojito, Black, Bright White, Sting Gray, Ocean Blue Metallic and Firecracker Red. On the inside, the Moab Edition includes the Leather Interior Group, the Safety Group and the 8.4-inch UConnect infotainment system with a nine-speaker Alpine sound system. Finally, the Selec-Trac full-time two-speed transfer case and a Trac-Lok limited slip rear differential are standard with the Wrangler Moab Edition, so straight from the factory – this Jeep is ready to hit the trails. 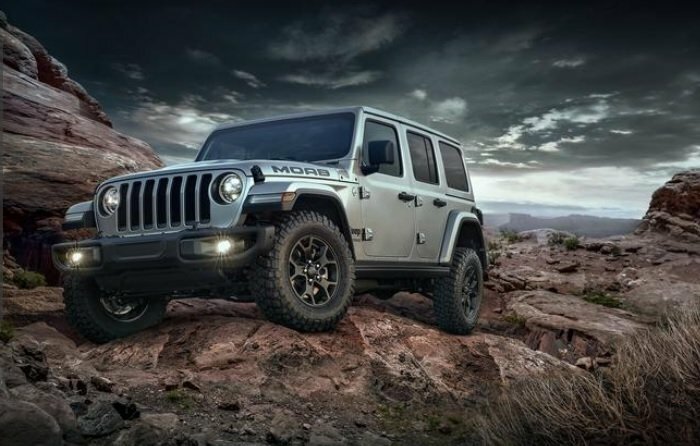 There is no pricing for the Moab Edition package yet, but with the Sahara model starting just under $40,000, the first Wrangler JL to sport the Moab name will likely start slightly north of $40k. There is also no hint as to how many examples of the Moab Edition package will be sold, but this looks like the kind of option package that will be offered in unlimited numbers until the order banks close, but after that, there are likely to be some of these Moab-themed Jeeps on dealership lots.